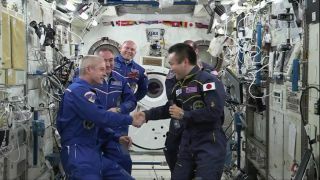 Japanese astronaut Koichi Wakata (right) passes command of the International Space Station to NASA's Rick Swanson (left) on May 12, 2014. Three International Space Station crewmembers are set to return to Earth tonight (May 13) and you can watch it live online. After living and working aboard the orbiting outpost for about six months, NASA astronaut Rick Mastracchio, Japanese astronaut Koichi Wakata and Russian cosmonaut Mikhail Tyurin are expected to board their Russian Soyuz capsule and undock from the station at 6:36 p.m. EDT (2236 GMT). The trio is expected to land in the Central Asian nation of Kazakhstan at 9:58 p.m. EDT (0158 May 14 GMT). It will be 7:58 a.m. at the landing site, which is southeast of Dzhezkazgan. "Folks, my last tweet from space," Mastracchio posted on Twitter today. "Stay tuned for post flight fun." Wakata acted as the first Japanese commander of the space station for part of his time on the orbiting outpost. He passed over command to NASA's Steve Swanson — one of the crewmembers staying onboard the station — in a change-of-command ceremony Monday (May 12). "Today, I finished the role of ISS captain, NASA's Swanson took over," Wakata said in a translated May 12 post on his Japanese language Twitter account. "I feel teamwork and the crews of ground control stations around the world led to excellent results in system operation and experiments in the ISS." The $100 billion International Space Station is the result of a collaboration between 15 different countries and space agencies including the United States, Russia, Canada, Japan and Europe. Construction began in 1998 and it has been continually staffed by a rotating crew of astronauts and cosmonauts since 2000. NASA recently extended the life of the space station through the year 2024. Visit Space.com today for live video coverage of the Expedition 39 crew's Soyuz landing. You can also get minute-by-minute landing updates from our partner Spaceflight Now via its Mission Status Center here.